Can't make it to a food drive this holiday season? We've launched a winter virtual food drive so you can help feed needy families any time of the day or night! 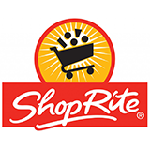 Purchase a $5 bag of groceries, or as much as $500 in grocery items. It's easy, secure and convenient! "Money is tight and now I can give my family good, healthy food more often," said one young mother of two at a recent GROW Truck distribution. The GROW Up with Good Nutrition Initiative is making a difference in the lives of young families, thanks to Stop & Shop's Our Family Foundation. Our Thanksgiving for All campaign collected 20,919 turkeys and 416,985 pounds of trimmings - enough to provide more than 540,000 meals! Thanks to the thousands who gave so generously so more families could enjoy a holiday meal. 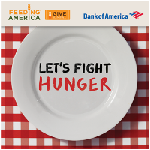 There's still time to Give a Meal with Bank of America! For every dollar donated online at bankofamerica.com/give. Bank of America will match it by $2 now through December 31. Help put more food on the tables of struggling families this holiday season. 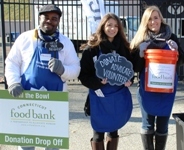 Watch Bank of America employees volunteer at a Bridgeport Mobile Pantry with News 8! 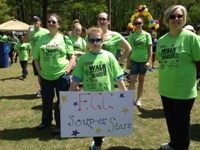 2015 Walk Against Hunger registration coming soon! Registration opens in January for our 2015 Walk Against Hunger! There are four locations to choose from. Help two local food pantries get a holiday makeover from Walmart! The top 75 pantries receive $20,000 each! Click here to vote every day until December 12. Donate $1, $3 or $5 at the register.